In this best-selling novel, Patrick D. Smith tels the story of three generations of the MacIveys, a Florida family who battle the hardships of the frontier to rise from a dirt-poor Cracker life to the wealth and standing of real estate tycoons. The story opens in 1858, when Tobias MacIvey arrives in the Florida wilderness to start a new life, and ends in 1968 with Solomon MacIvey, who realizes that the land has been exploited far beyond human need. Between is a sweeping story rich in Florida history. 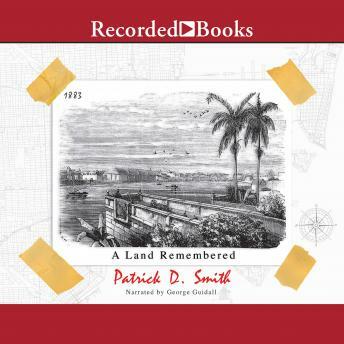 A best-selling novel of Florida historical fiction, A Land Remembered was nominated for a Pulitzer Prize and received the state's highest literary award from the Florida Historical Society, the 1986 Tebeau Prize for the Most Outstanding Florida Historical novel. After my mother wouldn’t stop bringing this book up (for years) and hearing that my grandmother and even my father (I’ve never known him to pick up a book)read it made me finally cave in and purchase it when I couldn’t think of anything else and boy am I glad I did! This book was a real page turner and being born and raised in Florida everything in this book felt relatable. This is an unforgettable novel. I highly recommend! I couldn't stop once I started this book. I'm not a big reader but books like this make me return for more. A great read for all people living in Florida today.